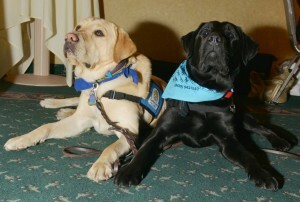 We are one of the few certified Service Dog Trainers in Northern Virginia. At Off Leash K9 Training, we specialize in basic and advanced obedience, behavioral modification, therapy dog certification, and service dog training. We have over 50 locations throughout the United States; however, our HQ is right here in Northern Virginia! 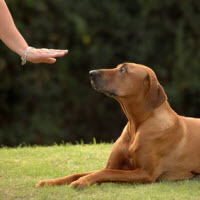 At our HQ location, we are composed of some of the best dog trainers in the country! 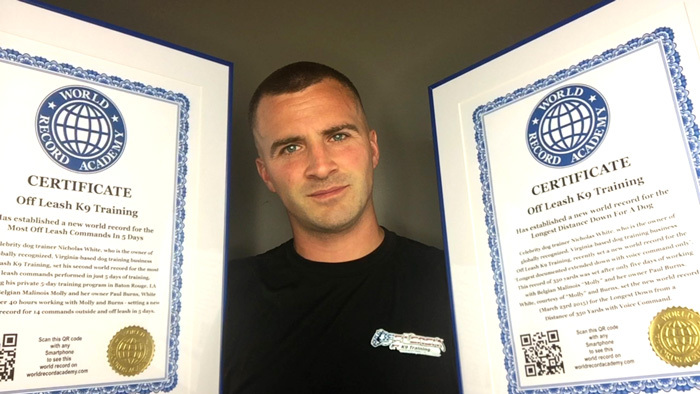 Our trainer’s experience range from former employees of the US Marine Corps, US Secret Service, Department of Defense, and private contractors. Off Leash K9 Training has been featured on ABC, Yahoo, Virginia and Maryland Dog Magazine, NoVa Dog Magazine, named Wikipedia’s Top 20 Trainers in the World, voted Best Dog Trainers in Northern Virginia by Northern Virginia Magazine in 2014 and 2015, trains for numerous celebrities and athletes, and officially holds 2x World Records in off leash obedience. We currently have over 750 before/after videos on our YouTube channel, here you can see dogs ranging from 6lb Chihuahuas to 200lb Mastiffs and just about everything in between. 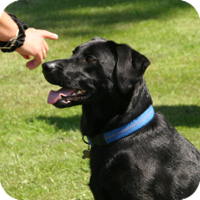 If you want your dog to become a certified service dog, therapy dog, or just respond with military/police precision, Off Leash K9 Training is the place for you! Service Dogs can assist people with physical, neurological, or psychological disabilities. Service Dogs help by performing everyday tasks to ease the burden on the consumer. Service Dogs provide a wide range of assistance services for persons with mental and physical limitations. Service Dogs can alert people with hearing impairment to sounds including doorbells, ringing phones and traffic. Service Dogs can help people with Post Traumatic Stress Disorder, Military Sexual Trauma, or Traumatic Brain Injury to function with more success in public. Service dogs help their masters feel more secure and ease stressful situations in public. Every Service Dog is individually trained to address the unique needs of the person that will be their master to accommodate the tasks they will need to perform. can improve life for a disabled people’s and provide increased independence. Service Dog Training teaches dogs to retrieve objects including dropped keys, push button like elevator door buttons and hit switches to turn on/off lights. Service Dogs Provide social support to help the disabled people feel like more of a complete person, gain confidence and connect with others in public with less stress. Service Dogs can alert people to medical emergencies, including diabetic or epileptic seizures, low insulin level warnings and life-threatening situations like impending heart attacks or strokes. Service Dogs enable disabled people to live full, independent lives with the help of a canine companion. Service Dogs are specifically trained to assist the physically disabled for mobility with wheelchairs. A service dog can guide the blind and near blind, and assist severely autistic people daily tasks. 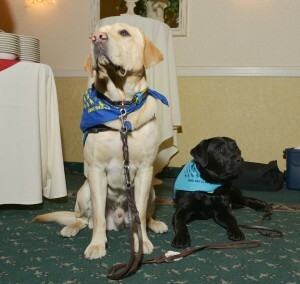 Service Dogs learn skills through rigorous training that goes beyond typical dog obedience training. Your dog can be certified as a Service Dog through Off Leash K9 to exceed the International Association of Assistance Dog Partners’ standards. Service Dogs are trained individually to perform specific tasks to enable a disabled person to live a more full life. Adding functionality to improve the life quality of a disable person is a goal for service dog training. The disables have a legally protected right to be accompanied by a service dog in public spaces. Emotional Support Dogs provide therapeutic health benefits for people suffering with psychiatric disabilities, post-traumatic stress disorder, mental impairment including Alzheimer’s and dementia to help them lead more fulfilling lives. Emotional Support Dogs are not trained to complete specific tasks and owners do not legal rights in public spaces. An emotional support dog is treated as a “reasonable accommodation” in the workplace or for housing with a No Pets policy. Therapy Dogs are trained to deliver emotional comfort and affection to provide health improvements and support. Therapy Dogs can be invited in as a volunteer in hospitals, schools, nursing homes, schools and/or libraries to help reduce stress and improve a sense of wellbeing in the people these dogs come in contact with. How long does it take to train a Service Dog? 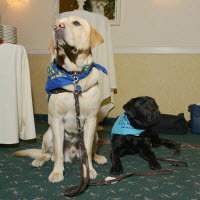 Assistance Dogs International approximates 120 hours over 6 months. A well-trained Service Dog should be trained 1 to 2 hours per day over 6 months – in other words 180 to 360 hours. Service Dog Certification You can take pride in what you and your dog can accomplished as a “certified” graduate. Each program’s requirements and benefits are different and it is up to you to be a good consumer and find the program that best meets your needs.